Former Director of Development for Disney and current Creative Producer at the Levity Group Leah Hoyer started the day with a talk entitled “Forward Thinking, Back to Basics”. She focused on the fact the fundamentals of storytelling have not changed. In short, the way characters interact with their world creates the story. And although stories are no longer told on just one platform, or from just one perspective, producers should not to rely too heavily on new technologies to deliver the experience. Hoyer then encouraged producers to focus heavily on early character development, as this leads to more rounded, motivated and interactive transmedia experiences. She clarified that while the user often embodies the main character that does not mean that this character is the user. Hoyer feels this misunderstanding often produces underdeveloped central characters in interactive storytelling. In addition, she comments that secondary characters (in a linear storytelling sense) provide a often neglected opportunity to ‘dive deep’ into new worlds to vastly extend the storytelling experience and scale. Unlike linear storytelling, this doesn’t dilute the original experience, it just moves it on to new spaces and new audiences. And she concluded by repeating her core message: media has changed, the fundamental rules of storytelling have not. Next up: Warren Coleman, the co-writer/director on Academy Award-winning animated feature “Happy Feet”. 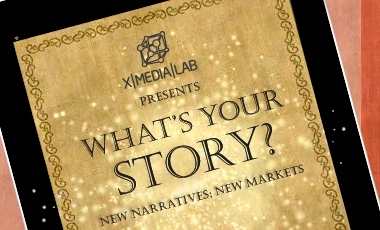 He began by highlighting the impact of in-production audience testing: the opportunity to understand whether key moments of storytelling connection are working and having impact. Coleman then discussed the relationship between story and play. Unlike more traditional media construction, “the paint is still wet right to the very end in the digital pipeline” and Coleman believes a playful approach to production will create a dynamic and believable story. As a former actor, Coleman brings performance to writing partnerships. Coleman encouraged the XMediaLab delegates to perform their work – “go behind the line” – from the start. In his experience of animation, this hugely aids the director in visualizing the story and helps to fix narrative flaws long before costly production or talent engagement. But having built a script based on play, when starting to work with talent/actors Coleman warns against becoming rigid, and encouraged an improvisation and playful approach throughout production. Coleman then discussed degrading ‘perfect’ animated experience – adding in camera dolly-shake to long animated shots, for example. Flaws help the audience to buy into a created experience, making it more real for them. Coleman comments that digital creatives working in totally constructed environments should use tools to make it look like you are not using any tools at all. Again, play becomes not only a crucial part of story development, but also story delivery. Next up: Linda Aronson, author of “The 21st Century Screenplay”, talking about parallel, or non-linear and ensemble, narrative. Unlike novel fiction, Aronson believes a film audience is unforgiving and will not tolerate slow starts, diversions or inauthentic elements. She believes this is because our brains react differently to written and visual story. A film audience is engaging emotionally, to the extent of ‘mirroring’ or visceral engagement with the story. In her session, Aronson explored how playing with structure alone presents huge opportunity in feature narrative: complex non-linear narratives can pull together stories that would not survive linear telling.